"This is so easy with amazing results. 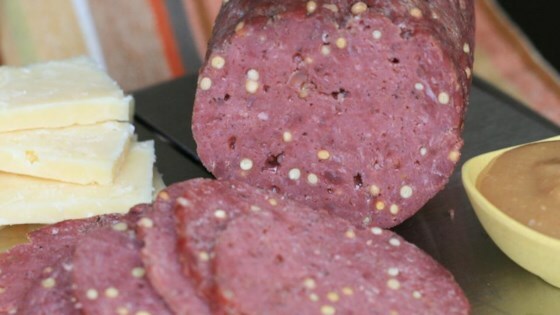 A mildly spiced summer sausage made with mustard seed and black pepper. It's great for snacks with chunks of cheese on the side." In a large bowl, mix together the ground beef, mustard seed, garlic powder, liquid smoke, curing salt, and pepper using your hands. Form into two equal logs, and wrap each one in aluminum foil with the shiny side facing the meat. Refrigerate for 24 hours. Preheat the oven to 325 degrees F (165 degrees C). Poke small holes through the aluminum foil in the bottom of the meat rolls using a toothpick. Place on a broiler rack and fill the broiler pan with 1/2 inch of water. Bake for 90 minutes in the preheated oven. Cool slightly, then refrigerate for 12 hours before unwrapping and serving. Outstanding! I had high hopes after reading the reviews and it didnt let me down a inch. This is a wonderful recipe I keep it made and in the freezer all the time. This summer sausage is great!!! I think next time I'll make a double batch...it went way too fast!! !